Twins in separate sacs. You might have heard your doctor or another medical professional talking about this, or maybe they mentioned it to you directly, and you’re wondering what it means. What Does It Mean When Twins Are in Separate Sacs? No matter how you heard about it, relax. It’s nothing to worry about, because it’s mostly just medical jargon. Twins in two separate amniotic sacs is normal. It’s the most regular type of twins, the most regularly occuring, and it comes with the least amount of side effects and possible problems, so you should feel good! This is a good sign for you and your babies! There are actually two types of situation where your twins are in separate sacs, called dichorionic diamniotic twins, where your twins have separate sacs and placenta, and monochorionic diamniotic twins, where your twins share a placenta, but have separate amniotic sacs. We’ll go into the differences below. This is the most common type, and like we’ve just explained, it’s the one that comes with the least amount of side effects an unfortunate problems. So that’s good! 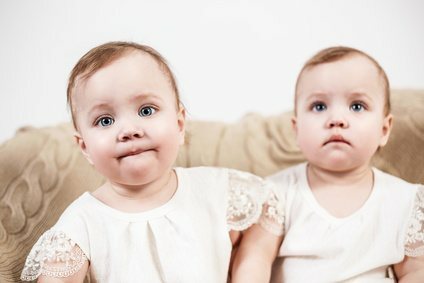 Di di twins can be identical or non-identical, but are actually more likely to be non-identical, because of the way this type of twin occurs in your womb. Now, every pregnancy is hard, but this one, where your twins only share a living space and nothing else, is by far the easiest for both you and your babies. There’s very few complications that can happen with these types of twins. The most likely thing is the slightly premature birth and low birth weight that’s common with almost all twins, so try to relax. Mono Di twins, or twins that share a placenta whilst having their own amniotic sacs, start as just one egg which splits a few days in, for reasons that are still unknown! Because they come from the same egg, this type of twin is always identical, so if you really want a pair of identical twins and you hear that your twins share a placenta, you’re getting your wish! Unfortunately, because this type is a little atypical, there’s a few more problems that can occur. Luckily, advances in modern medicine and surgical procedures have made these much less likely to cause long term problems, so your chances of going to full term and delivering a pair of healthy identical twins is the highest it’s ever been! If your twins share a placenta, your doctor might want to bring you in for more regular scans, and other things that friends and family that have gone through pregnancies won’t have had. Don’t worry. This is normal, and they’re experienced in dealing with women in your situation. To Recap, What Does It Mean When Your Twins Are in Separate Sacs? Your twins are probably going to be in separate amniotic sacs, this is completely normal. Your twins being in separate sacs means that your pregnancy is more likely to be safe and problem free. Di di twins are the most common type, don’t have to be identical, and is most likely to be the easiest. Mono di twins share a placenta, and so you are a little more likely to have issues, but modern medicine means that as long as these issues are found early, you and your babies are going to be okay. Whether you’re mono mono, or mono di, you shouldn’t worry. Remember, the best thing you can do is be informed, so we’re glad you’re here. At Twinstuff, we’ve got articles on everything you might face during your pregnancy, so take a look around. We’ve also got our Facebook group where you can meet other parents. And if you’ve got any questions about twins in separate sacs feel free to ask us in the comments below! We love to talk to moms and expectant moms to be, just like you! Mine are ID, but were di/di. We did a dna test. I am so scared and nervous and overwhelmed. I just found out I’m almost 7 weeks pregnant with twins. Ive had 2 misscarriages prior to this and I’m so worried and depressed and happy. There is no course for alarm. You case is similar to mine and i have not had any problems throughout my pregnancy. I am week 36 and hoping for the best.